Preheat the oven to 400F. 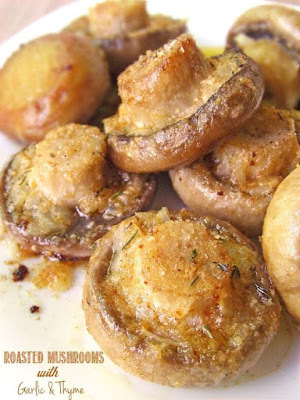 Lightly fry the mushrooms, cap-side down, in hot oil for 2-3 minutes. Arrange the mushrooms in a a 9x13 cooking dish (or whatever rectangular oven-proof dish you have on hand) with the stalks facing upwards. In a small bowl, mix together the butter (make sure its softened), garlic, thyme, lemon juice and seasoning..